Skipped last Tuesday’s ride but not today’s! There’s a story to that. Tuesday. Yes, I should have ridden Tuesday. I didn’t ride Tuesday. Time to let the cat out of the bag, as it were. Because it was all about… a cat. My son & daughter (Kevin & Becky) had taken a few days off to visit Disneyland. So I didn’t ride Tuesday because Kevin wasn’t around? Nope. I didn’t ride Tuesday morning because I’d gotten very little sleep that night, because Becky’s cat was out most of the night. How did she know? She’s got a GPS tracker on him, and, from Disneyland, she was able to watch as the cat strayed further and further away from the house, instead of coming in around 9pm like he usually does. By 2am she was totally freaked out and texting me. At 3am I was outside calling for a cat that the GPS said was a good half mile away. At 4am I finally gave up and tried to get back to sleep. At 5:45am the cat comes into the house, announcing his presence by jumping up on the bed and wanting attention. So I sent a photo to Becky, proof the cat was home, and slept a short while. When the alarm went off at 6:50am, and it was lightly raining outside, I’m thinking no, this isn’t going to happen. What created that rational moment I have no idea; it’s not like me. I went back to bed, waking up at 7:20am and briefly entertaining the idea of quickly throwing on my clothes and getting out there. Still might make it to the start by 7:45am. That thought passed rather quickly, replaced by some measure of guilt for not riding, but not enough to keep me awake. Got up at 9am and got ready for work. So that was my fun Tuesday. Not. Today was much better. 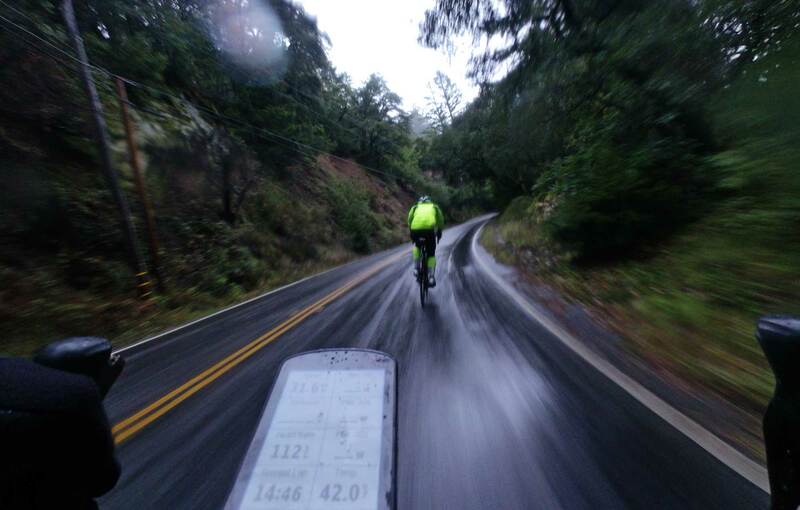 Would have been nice without wet roads, but the rain bike didn’t feel all that bad, and Kevin fortunately wasn’t feeling all that fast. Turned into a pretty nice ride, and not so deathly slow that we couldn’t do the full ride, including the West Old LaHonda loop. No views though; there was a high fog just about everywhere. Unfortunately it never really rained, just a light drizzle at times, so my rain bike’s a complete mess. Maybe for Sunday’s ride it will be pouring and clean it up.